Warning: This article contains spoilers for Kingsman: The Golden Circle. It's no secret that director Matthew Vaughn's punchy sequel to his 2015 hit Kingsman: The Secret Service is about as star-studded as films come. Actors Taron Egerton, Colin Firth, and Mark Strong return for Kingsman: The Golden Circle, joined by newcomers and big-name talent like Jeff Bridges, Halle Berry, Julianne Moore, Pedro Pascal, and of course, Channing Tatum, whom fans saw in the film's first trailer. But as it turns out, Tatum's character isn't in The Golden Circle has much as one would expect. 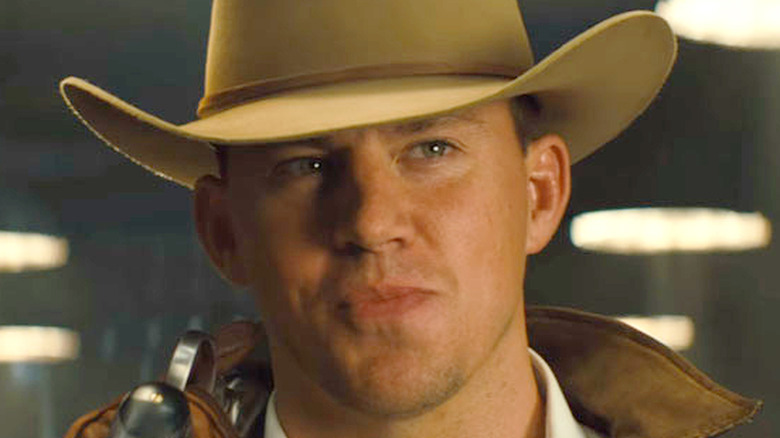 Tatum, who plays the nefarious Statesman agent Tequila, was heavily featured in promo images and footage for The Golden Circle, getting audiences excited to see a ton of the Magic Mike actor in the film. With so much emphasis placed on Tatum's lasso-swinging country character early on, it's easy to believe he'd be a major player—and that much harder to understand why he wasn't. Speaking with The Hollywood Reporter, Egerton, who takes the lead as rising Kingsman agent Gary "Eggsy" Unwin, explained why Tatum's character was (literally) put on ice. The sequel shows Tatum's Tequila fighting against Strong's Merlin and Egerton's Eggsy, but never with them, and then falling victim to Moore's Poppy after he ingests her toxic drugs. In order to keep Tequila from dying, the other characters decide to freeze him… for the entire rest of the film. Pascal's Whiskey takes on a much more prominent villainous role as a result and brandishes the deadly lasso thought to belong to Tequila. "There was a shift of sorts. There was some changing because of Channing's schedule. The thing is that the script is constantly in flux," explained Egerton. "Pedro and I got to spend so much time together and he's amazing." Though Tatum is absent from the majority of the film's second half, it doesn't necessarily mean that he won't show up in a possible third movie (or even beyond). The Golden Circle ends on a cliffhanger, with Tatum's Tequila returning to London to the Kingsman headquarters. "I know the next storyline," Egerton teased, hinting that Tatum could have a bigger role if another sequel gets greenlit. Director Vaughn previously told reporters at a screening of some of The Golden Circle's early footage that he had already been thinking about a third Kingsman movie while he was working on the second. Egerton then laughed, "But what the f*** can I say? Not much." Before you head out to see Kingsman: The Golden Circle, check out what critics are saying about the movie.